The Fuselage (Part 8) page documented the work done on the fuselage section just in back of the canopy and its attachment to the fuselage section in front of it. On this page, I'll document how the bulkhead caps and stringers were attached to the new section and how the new fuselage panels for that section were made and attached. 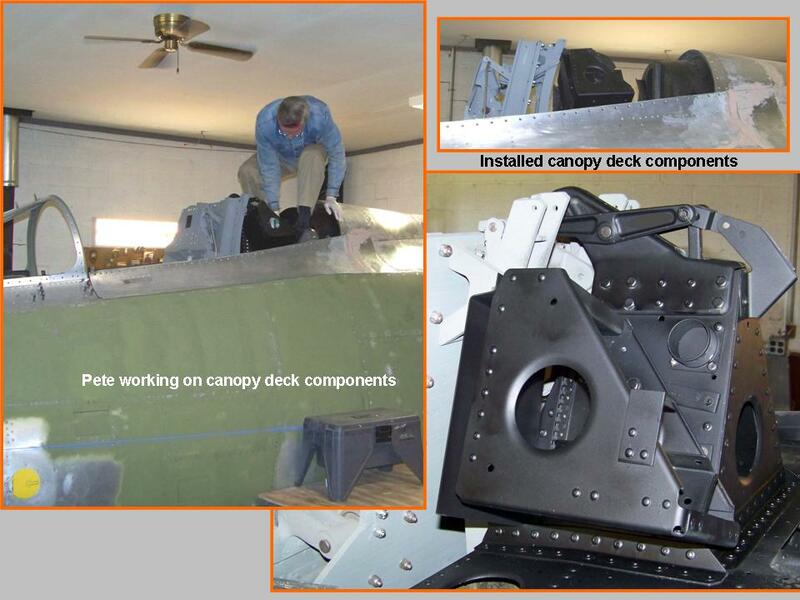 You will also see the completion of the crush panel and the canopy frame. Finally, you will see the application of the self-etching primer and the application of the aluminum lacquer to the combined fuselage sections. 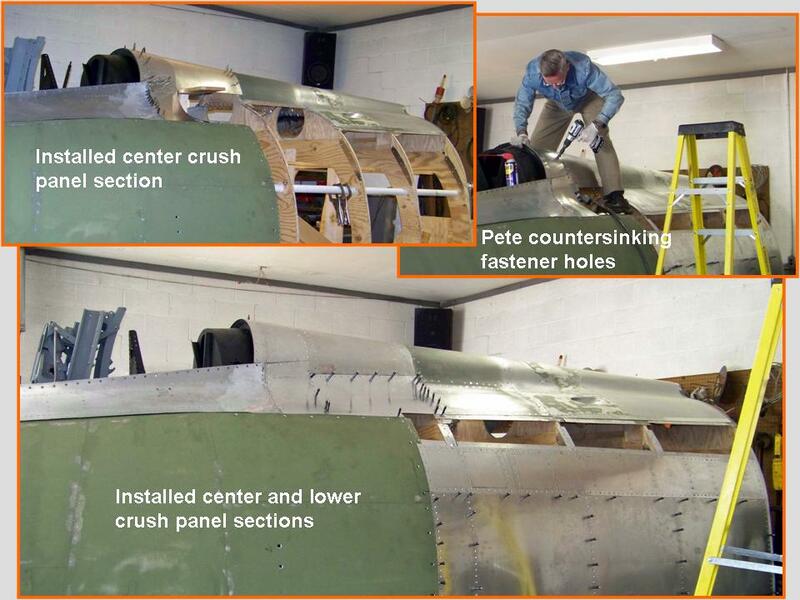 Figure 1, cell 02, shows a composite picture that documents the first side panel installation on the fuselage aft-of-cockpit section. Cell 03 documents the nearly-completed metal work on the fuselage aft of the cockpit section ... just before I discovered a major discrepancy. As it turned out, this was a perfect example of two steps forward, one step back. The initial reaction was to think about lowering the back of the fuselage section aft of the cockpit, thus raising the front of the spine section. The problem with that notion was that it would change the slope of the spine section -- so that was not a good solution. The problem stayed with me through the day, the evening, and the night. Finally, at about 1:42 a. m., it occurred to me that I had built the spine section on a movable frame that was bolted to the main bulkhead section. Therefore, we could raise the entire spine section without altering its slope. The problem with that solution was that we would have to take all the skin panels down, as well as the frame. 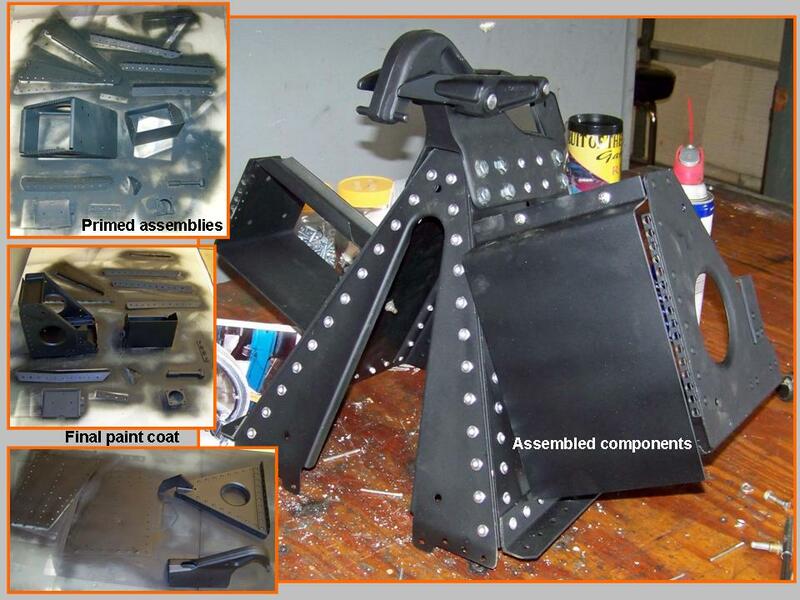 (The lower left insert in Figure 1, cell 03, shows the frame end caps and stringers we took down after the skin panels had been removed.) After Steve and I had spent two days taking the results of our hard work apart, we moved the spine section and, yes, the fit and slope were now perfect. Unfortunately, the just-described solution led to yet another problem ... we would have to fit the crush panel sides to match the pitch on the canopy frame AND the section that fit against the back of the crush panel. The solution to THAT problem was to take the spine section apart and then to reshape the entire spine section frame. I sure wish I had not tried to save time by building the entire aft-of-cockpit section separately ... but that's the advantage of 20/20 hindsight. Never mind, with that valuable hindsight, we spent the last week of August and the first two weeks of September, 2010, re-doing a lot of work. 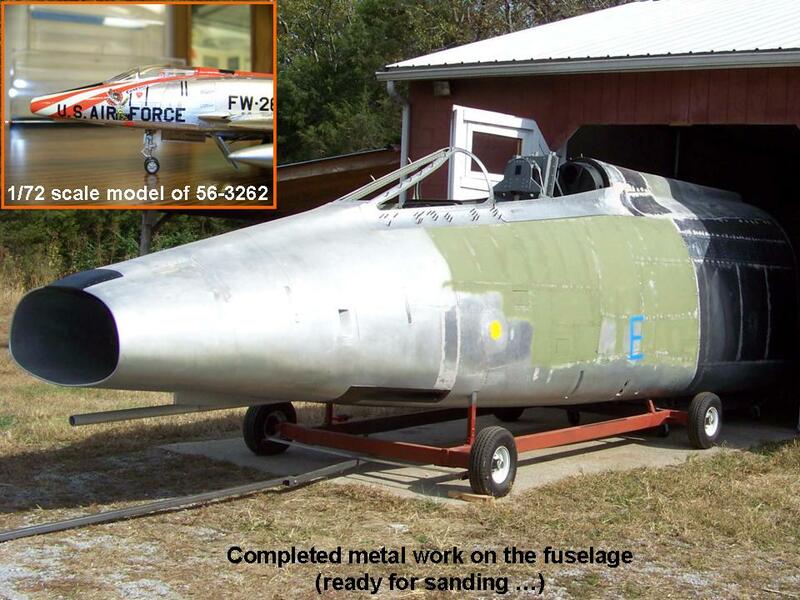 The good news is that the "model" will match the real F-100D fuselage when we're done. The results of all the revisions are documented in Figure 2. 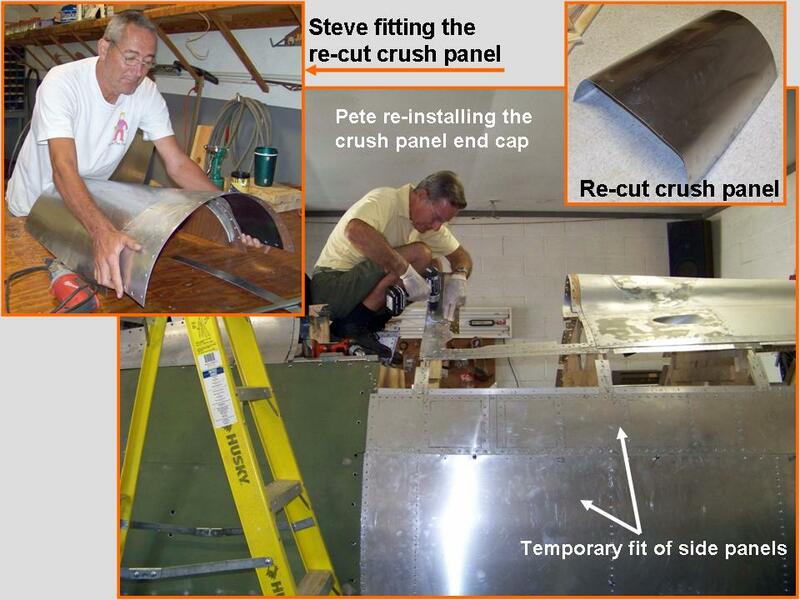 The composite picture in cell 01 shows the crush panel that I re-cut and re-shaped and the installation of the crush panel end cap. 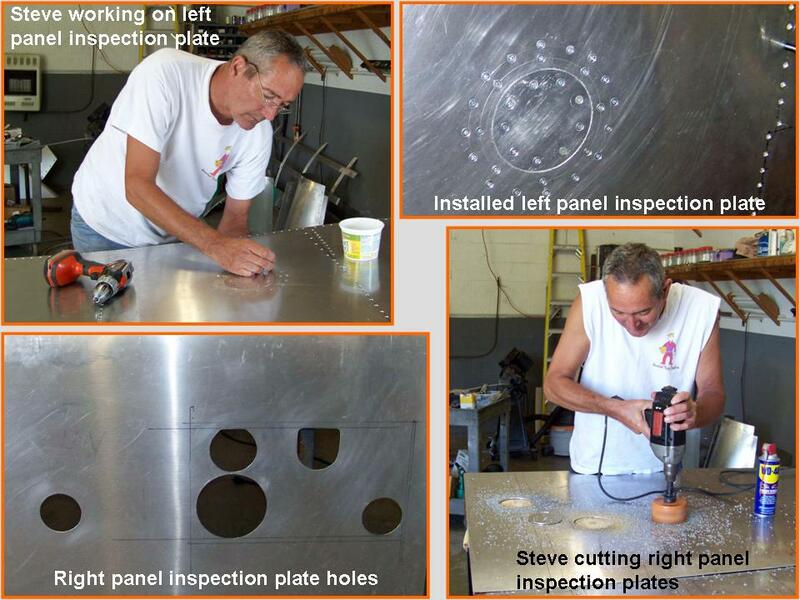 It also shows Steve working with the (removed) back canopy panel to make the small adjustments that would ensure that the new crush panel would fit well. Note also the temporarily-attached side panels that were used to check the fit on the repositioned end cap and stringer section. 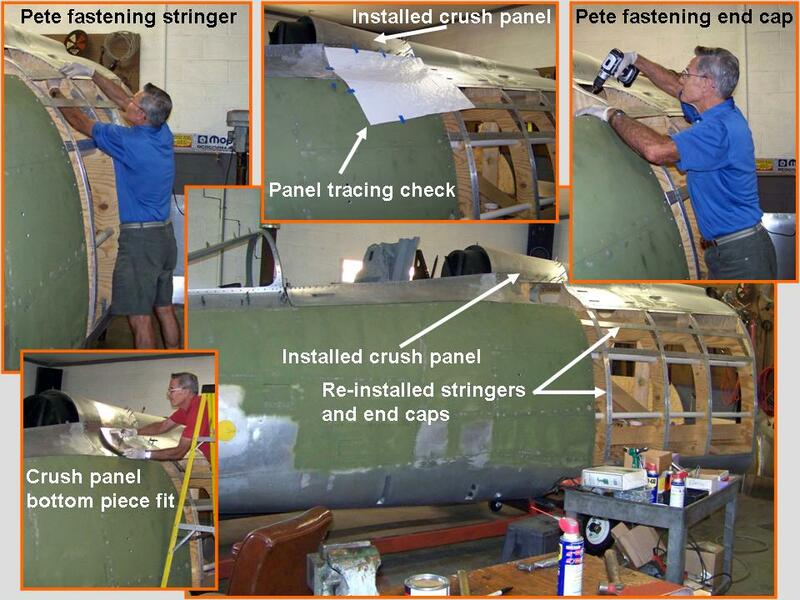 Figure 2, cell 02, shows a composite picture that documents the re-attached end cap and stringer framework and the re-attachment of the new crush panel. Special word of thanks: Pete Felts, who has taken so many of the detailed pictures of 56-3000 -- not to mention all those skin tracings that helped me make so many of the canopy frame components and inspection plates -- wrote the following comment: "I think it would be appropriate to show appreciation to Chief MSgt. Anthony Jackson of the 149TFG, Texas ANG. 56-3000 provided many etchings and "detail" pictures and Tony was very kind to grant me free access to the airplane." I certainly concur with Pete Felts' comments and I add my heart-felt "Thanks!" to Tony. 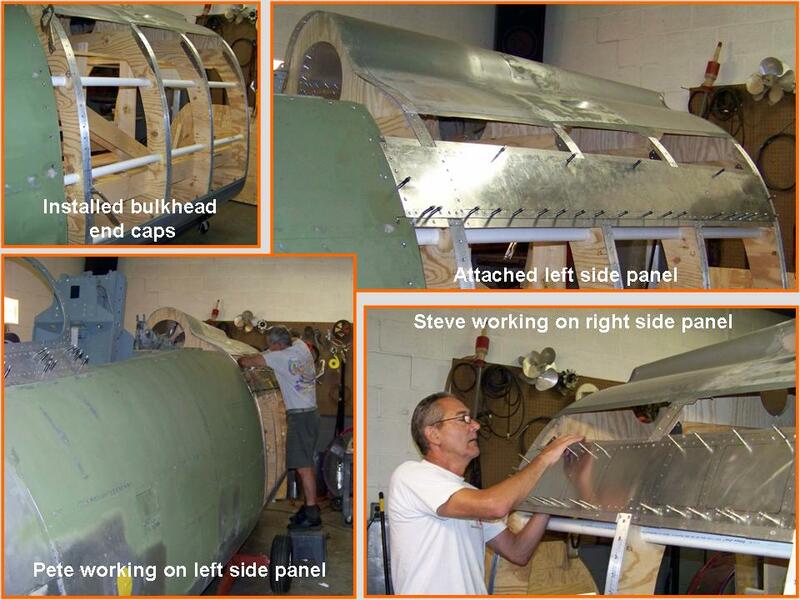 We completed all the metal work on the fuselage segment on Thursday, 28 October, 2010. 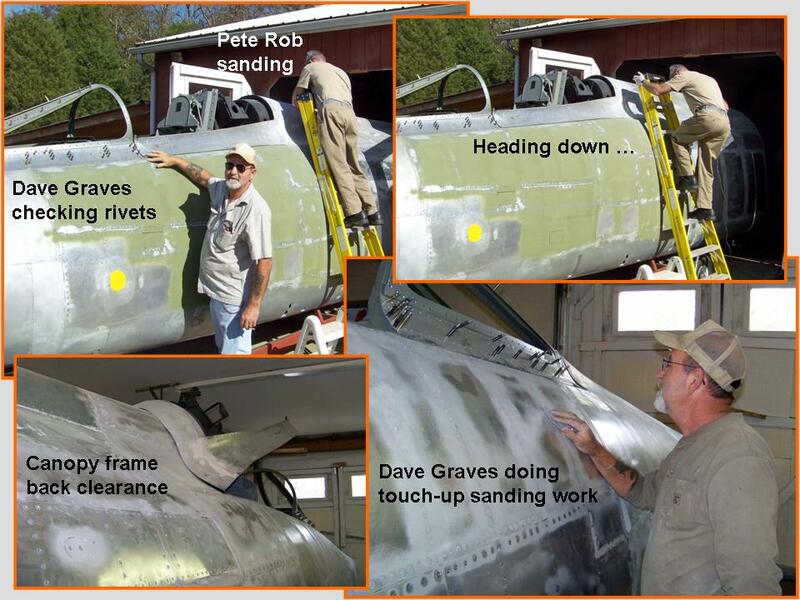 The next step will be to start prepping the fuselage for sanding, a process that will take several months. (A good paint job begins with a thorough preparation of the surface that will be painted.) 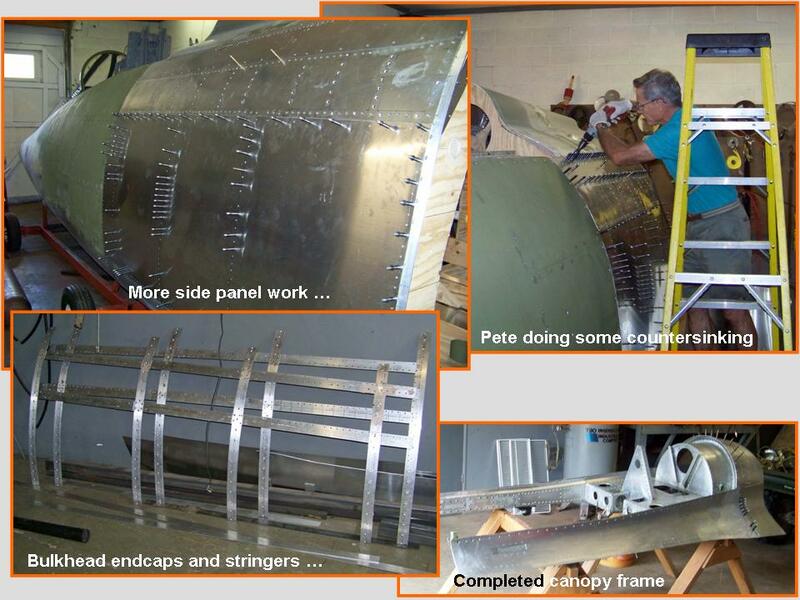 Figure 4, cell 01, shows the completed metal work on the fuselage segment, ready for sanding. We have rolled the fuselage segment outside to let us blow the Bondo- and aluminum dust away with the help of a B-I-G fan and the wind that tends to be ever-present during the fall season. 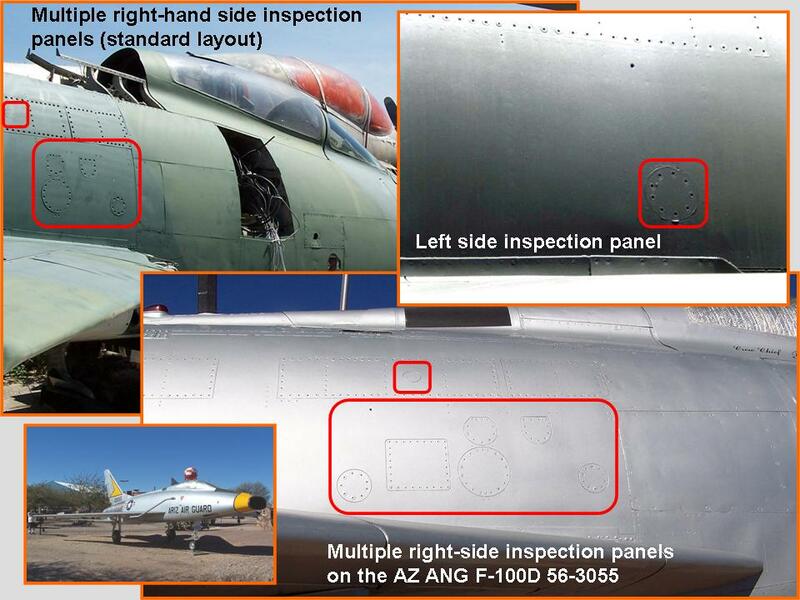 Note the inset that shows the paint job that will be applied to this fuselage segment. The 1/72-scale model reflects a 48th TFW Hun (as flown by Col. Smith) during the 1960 William Tell Gun Meet. I was very fortunate to have an official USAF photo of this aircraft -- and an old Hasegawa kit's painting instruction sheet that matches the photo perfectly. OK, most of the assembly work is done at this point. The next stage was prepping for the coming paint job. I've always been told that no paint job succeeds without a LOT of preparation, but there's no way I could have been prepared for the incredible amount of time it took to do all that Bondo work, followed by interminable hours of sanding. The amount of Bondo we used was amazing. We used pop rivets to attach all the skin panels, so each pop rivet's center hole had to be filled in -- THOUSANDS of them. And then there were the inevitable little "dings" that occur during the construction process, not to mention all those spaces between the skin plates that had to be adjusted. Finally, we had done what we considered to be first-class metal work ... but in the harsh sunlight, the panels that had required considerable bending -- such as the spine panels -- showed that some of the curves were not uniform in the transition areas. Bondo works perfectly to correct such details. 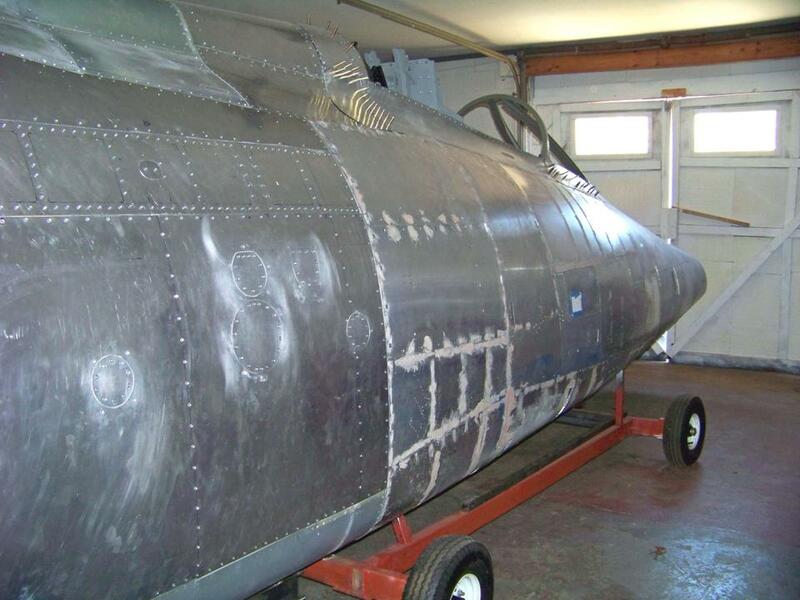 Once the basic Bondo shaping and filling work was done, the excess Bondo was sanded off. The initial shaping was done with a rotary sander with 80-grit sandpaper, followed by "detail" shaping with 120-grit sandpaper. Prior to the application of the self-etching primer, the entire fuselage segment would have to be sanded with 320-grit paper. (If additional flaws showed up after the 320-grit sanding, those would require more Bondo and more sanding.) Next, the filler-primer coat would be applied, followed by 400-grit sanding. 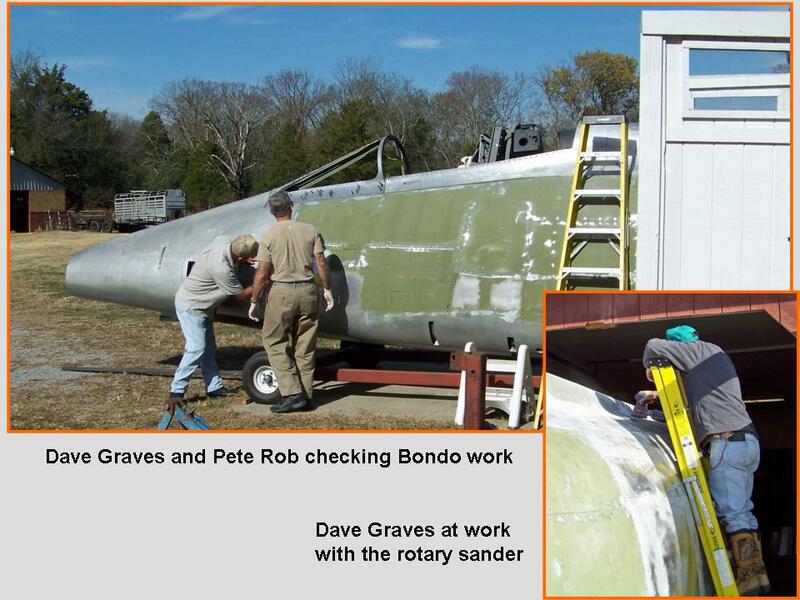 Figure 5, cell 03, shows the fuselage segment with its first filler-primer coat. At the time of this writing -- 26 November, 2010 -- the final paint prepping stage should require the investment of another 20-25 hours' worth of sanding, followed by another filler-primer coat and more sanding. When the sanding is finally done, we'll start painting ... but I suspect that it will be some time before that happens. (Painting is temperature-dependent and winter temperatures are not conducive to producing good painting results ...) In the meantime, we'll continue to work on the windscreen components and the canopy "glass" ... and the cockpit interior. 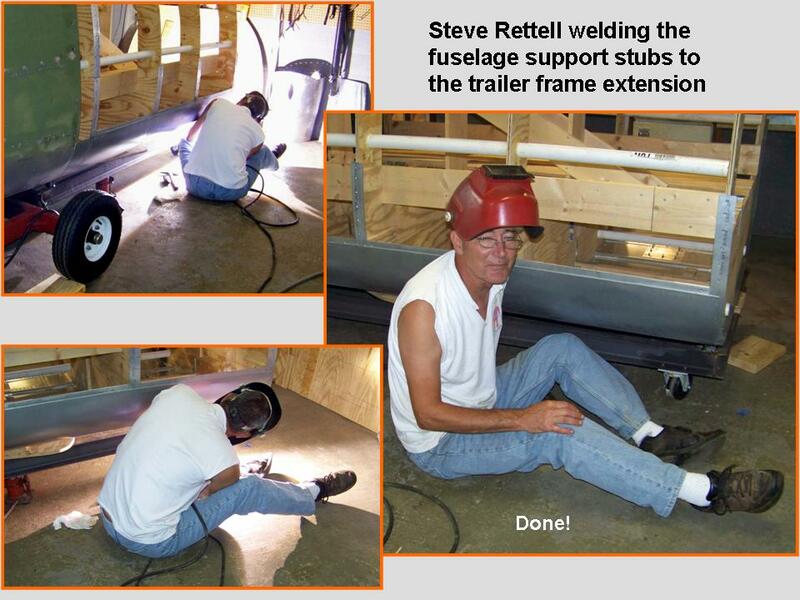 I will document that work in Fuselage, Part 10. And so the adventure continues ... Right now -- January 11, 2011 -- I'm hoping for some better temps so that we can roll "baby" outside for additional sanding -- and the subsequent painting. I'll start documenting that work in Fuselage, Part 10.